The Stockalper Archive in Briga brings together some 16,000 documents, ranging from the 13th century to modern times, including over 80 account books, collections of copies, reconnaissance registers and similar materials. The centrepieces of the archive are 13 commercial registers and accounts compiled by Kaspar Stockalper vom Thurm (1609-1691). Kaspar Stockalper’s business activities stretched from the coast of the <?xml:namespace prefix = st1 ns = "urn:schemas-microsoft-com:office:smarttags" />English Channel down to Lyons, Geneva, Burgundy and beyond the Sempione pass, stretching as far south as Milan and Genoa. The Institute of Research for the History of the Alps is currently completing a history of the population of the Upper Valais. The parish registers for the entire area of Briga have been fully recorded to create a demographic databank (from the mid 17th century to 1850). 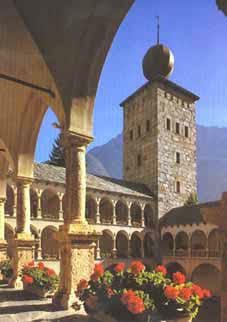 Stockalper Castle also houses the Archive of the Association of Historical Research for the Upper Valais. It includes thousands of deeds and documents that often also refer to the whole of northern Italy.